There aren’t many American cities where you can live without relying on a personal car. Sure, you could live in almost any city and take public transportation (usually a system of buses) some of the time, but few areas offer a complex network of trains, buses, cable cars, and two subways systems. San Francisco is one of those towns. And while many move to Baghdad by the Bay for a myriad of reason—tech, culture, burritos—a good amount of people live here because they don’t want to be stuck in traffic for most of their lives. We’ve broken down the San Francisco and Bay Area public system into digestible chunks should you choose to eschew vehicular transportation. While this guide will invoke the names of Uber and Lyft—which flies on the face of the Earth Day spirit—the majority of the following transit options are ones shared with the public at large, for better or for worse. The San Francisco Municipal Transportation Agency—or SFMTA—is a city department responsible for the management of all ground transportation in the city. The agency oversees not only our contentious municipal railway system (aka Muni), but also bicycling, paratransit, parking, traffic, walking, and ye olde taxicabs. Established by a voter mandate in 1999, the SFMTA consists of multiple San Francisco city agencies, including the Department of Parking and Traffic, Muni, and since 2007, the Taxi Commission. This agency is unlike any other agency in the country. Muni platform at the Powell Street Station. 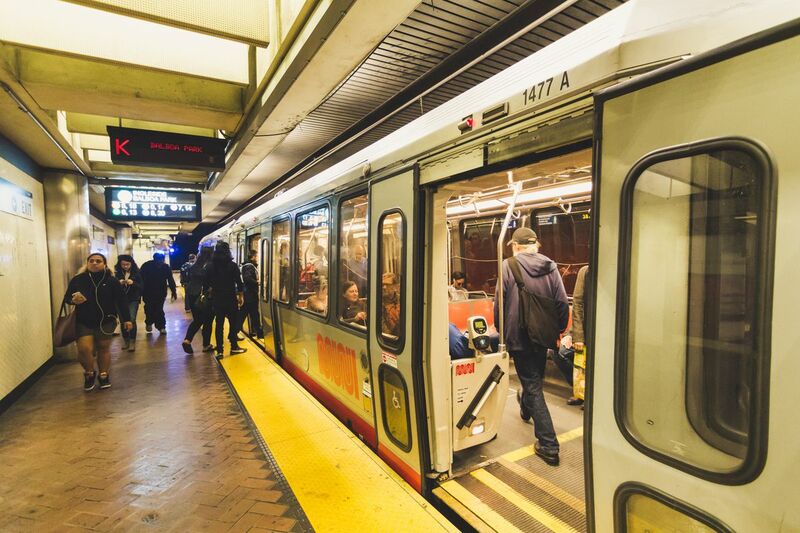 You will learn to love, love to hate, and just plain hate Muni. Recognized as the oldest publicly operated transit system in the nation, it sure can feel like it. Muni’s first-ever streetcar was the A Geary (now known as the 38 Geary), with service beginning on December 28, 1912. Now it’s the primary mode of public transportation for many denizens, be it by metro train or bus. The underground lines are the J-Church, K Ingleside, L Taraval, M Ocean View, N Judah, T Third, and S Shuttle. Buses run aplenty all around San Francisco. The busiest line is the Geary corridor with the 38 Geary and 38R Geary Rapid, which travels 6.5 miles in an east-west direction. It takes approximately 50 minutes from end to end. While Muni is in need of an overhaul—years of sluggish and spotty service culminating in a disastrous summer prompted Mayor London Breed to send a letter to SFMTA Director Ed Reiskin demanding immediate reform, or else—it did benefit from a recent bumper crop of new trains. Plans are also afoot for much-needed improvements: Two bus rapid transit projects have been approved for Geary Boulevard and Van Ness Avenue corridors, costing roughly $240 million to $270 million and $126 million, respectively. The Van Ness BRT will see two dedicated bus lanes in the median between Lombard Street and Mission Street, while the Geary BRT will have dedicated median lanes in the Richmond District—many rightfully argue that Geary Boulevard should be an underground metro—then curbside bus lanes east to Market Street. Fare: A ride on Muni costs $2.75 (cash) and $2.50 (Clipper/MuniMobile) for adults. Youth (ages 5 to 18) and seniors (65 and older) receive a 25-cent discount. There is also a Free Muni for Seniors and People with Disabilities program for people with low and moderate income living in San Francisco. People can apply here. Bay Area Rapid Transit—aka BART. So much to love. So much to dislike. The city’s other underground transit system can be used in lieu of Muni Metro if you’re trying to get around downtown. Choosing which one to use is a personal preference, although BART is quicker when it’s rush hour and seems to work better more often than Muni. BART offers a total of four lines throughout the Bay Area, with 48 stations that whisk an annual estimate of 124.2 million riders. If you want to get around San Francisco using the system, it’s usually an easier, safer bet. 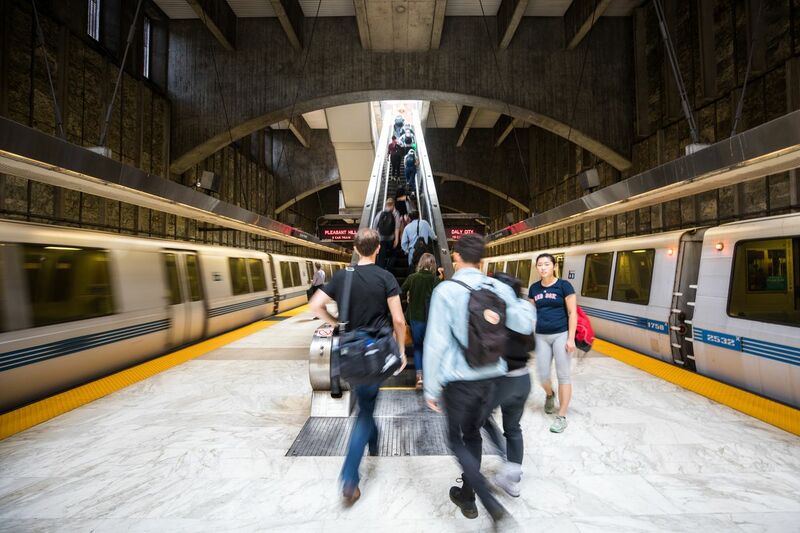 To get to the the Mission, Excelsior, Glen Park, Balboa Park, or the downtown area near Market Street, you could use a BART train as a substitute for Muni. Since opening in 1972, BART has brought the Bay Area closer together than anything else. Critics derided it as a boondoggle before it opened (as they do the upcoming High Speed Rail), but it has proven a success. However, the agency is not without its woes. In addition to grimy stations—most infamously at 16th Street and Civic Center—BART has major crime issues it has yet to handle, as well as a recent spat of controversy after anti-Semitic digital advertising appeared at the Montgomery Street station. Fare: Taking BART anywhere within San Francisco costs $2 to $2.50. Taking it outside of the city will cost more. BART’s fare calculator will help you figure out how much. The California Street Cable Car line. The country’s only moving national landmark—not to mention the city’s signifier, second only to the Golden Gate Bridge—isn’t just for tourists. Quite the contrary. 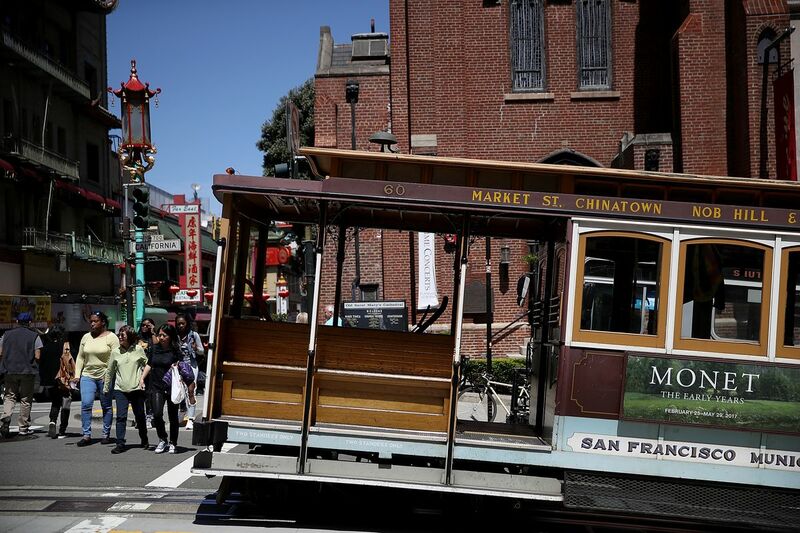 Residents living in Russian Hill, Nob Hill, Chinatown, and North Beach use cable cars daily to get to and from work in the Financial District. Fare: A ride on any cable car costs $7, technically. In most cases, however, cable car operators allow locals to board for a regular Muni fare. You can also use your Clipper card. Only tourists should pay the $7 price tag; it’s an unwritten rule. An Oakland-based public transit agency that serves the western parts of Alameda and Contra Costa counties in the East Bay and in San Mateo and Santa Clara. There are numerous AC Transit hubs, with many of then servicing BART stops such as Fremont, Lake Merritt, MacArthur, and San Leandro, just to name a few. Note: While the Transbay Transit Center is temporarily closed, AC Transit and Golden Gate Transit (another agency that operates from San Francisco to Marin) depart from the old Transbay Transit Center on the block bounded by Folsom, Howard, Beale, and Main Streets. There are some disabled people and older adults who, for various reasons, cannot take buses or trains with fixed routes. 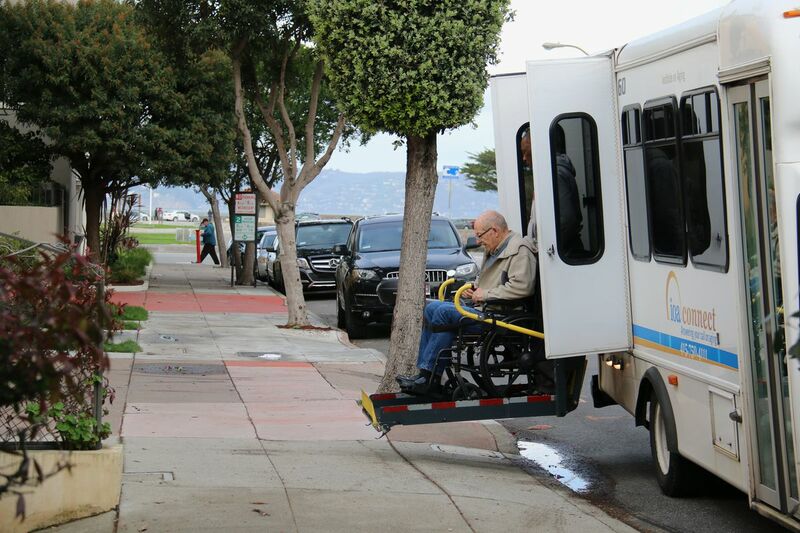 Paratransit services are offered alongside fixed-route public transportation and they usually provide door-to-door services in a taxi, van, or a bus. For the City and County of San Francisco, Transdev is the paratransit broker contracted by the SFMTA to provide paratransit services and administer the program. To be eligible for services, a person cannot independently use Muni or BART or a person cannot access or get to and from a fixed-route Muni/BART line. Guidelines for eligibility come from the Americans with Disabilities Act (ADA). For more on the rider experience of paratransit, check out this episode of the Disability Visibility podcast featuring two people with disabilities in New York, Denise DiNoto and Jess Moye. Be prepared for microaggressions and outright harassment while on Muni or BART. You have to be tough and fight for your right to exist in the same transit spaces as everyone else. If you’re a wheelchair user, you will see nonverbal expressions by riders as the MUNI driver has to spend a few extra minutes lowering the lift. There’s a lot of rolled eyes or exasperation because of these few minutes taken from their commute. It makes one feel like accessibility is an undue burden or something “extra,” rather than a right. Upon entering a bus or train, I usually have to back my wheelchair in while loudly saying, “Coming through, please watch your feet! Coming through!” Most people listen, but there are folks who will not budge, so be prepared for lots of butts and backpacks swinging right up in your face. Also, be prepared to take down the bus number, route, and driver number on the off chance that a driver refuses to secure you in the bus or refuses to pick you up, saying there’s no room for you. And be prepared to smell urine—Eau de SF—when taking an elevator at the Muni/BART stations downtown. Alas, it’s part of the transit deal, even though both transit agencies have promised in the past to clean up stations. Having numerous transit options, however problematic, is ideal, especially considering accessible minivans are incredibly expensive—the new vehicle plus modifications can cost upward of $50,000. For more information, check out the National Mobility Equipment Dealers Association. Commuter Sunday Parker wrote about navigating Muni and BART in 2016. Her account provides an eye-opening perspective of what wheelchair users experience every day. In 2017, two disability rights organizations, Senior and Disability Action and the Independent Living Resource Center of San Francisco, filed a class action suit against BART claiming that its filthy, often-broken elevators violate the civil rights of people with disabilities. The Clipper card system, which replaced Muni fast passes, is our city’s reloadable transit-fare payment method, which can be used on numerous Bay Area transit agencies, You can buy a monthly Clipper card for Muni (including cable car rides) for $78, or a Muni-plus-BART (including cable car) for $94. Please note that the latter option only includes BART rides within San Francisco. Clipper cards cost $3 for a blank card. You must have a minimum balance of $2 for adult Clipper cards and $1.25 for youth and senior cards. Clipper cards can be purchased at any Muni station, and participating Walgreens, Whole Foods, and other retail stores. 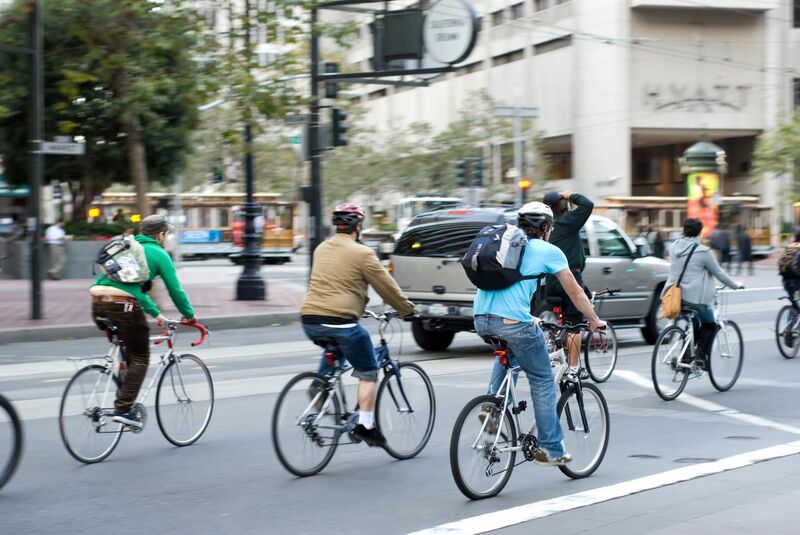 San Francisco is one of the best cities in the country for cycling. Among the many choice biking trails in the city, we are best known for the Wiggle, our famous stairway-shaped series of lefts and rights that begins at the Castro Safeway at Church and Market and avoids all the serious inclines. It’s also the gateway to the Western Addition, the Richmond, and the Sunset. Other prominent routes include Golden Gate Park, which is one massive bicycle zone during rush hours. Cesar Chavez gets you to the Bayview, San Jose Avenue directs you to the Excelsior, and so on. A word on bike lanes: San Francisco is blessed to have many of them. But while pedaling in a bike lane, you will often encounter objects that are not bikes. Lime e-scooter in Rincon Hill. The city gave permits to a couple of scooter companies in October, Scoot and Skip, so the two-wheeled machines have, at last, returned. These mobile devices have proven to be a cheaper and more environmentally sound way of traveling short distances in San Francisco. They’re also fun to ride. 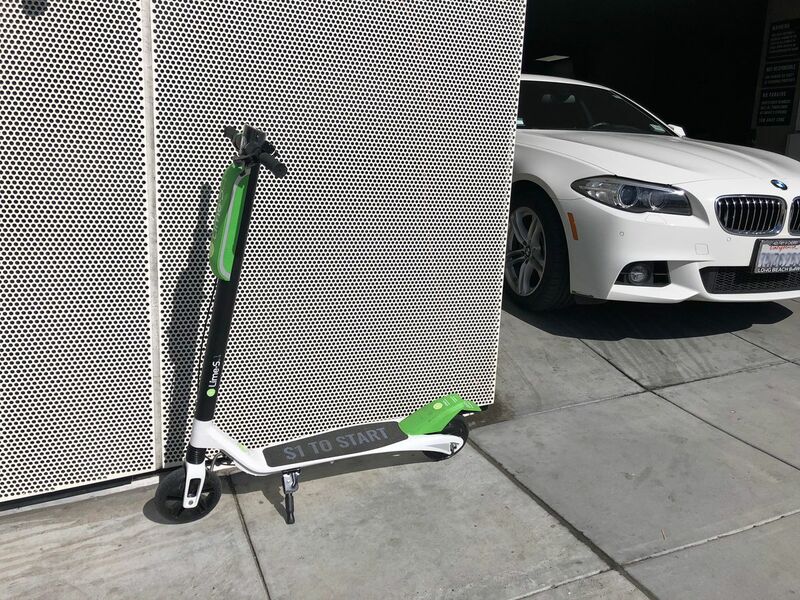 With the controversy and complaints about these scooters, what’s most problematic is the way riders carelessly park or leave them strewn on sidewalks—not the actual product itself, which provides a great option for a lot of people. Sidewalks vary throughout the city, and having a scooter in the middle of a path or blocking a doorway can be a big problem for any person who uses a mobility device or pushes a cart or stroller. It’s like manspreading. Try to be aware of how much space you take. Don’t be rude. Uber and Lyft all but eviscerated the taxi system in San Francisco—a system that had many flaws. Download one of the popular apps, plug in your information, and you will be whisked from point A to point B for a fee more affordable than your typical taxi fare. Uber, Lyft and other ride-hailing services are clearly popular for their convenience. For riders with disabilities, however, these private companies aren’t so great. While some disabled people use them, there are numerous reports in the media of drivers for these companies discriminating against riders with disabilities, such as refusal of allowing a service animal to ride. In the San Francisco Bay Area, it can be damn near impossible to find and call a wheelchair-accessible vehicle. 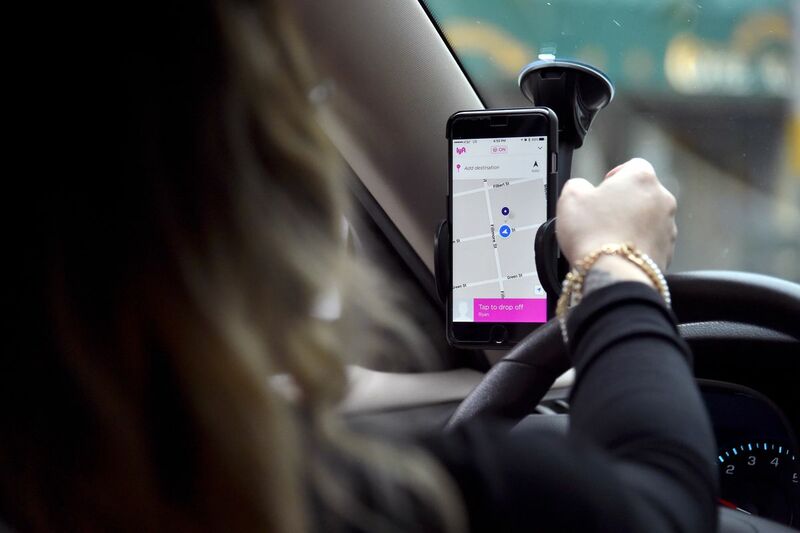 This year both Uber and Lyft have been sued by disability rights organizations and individuals claiming a violation of California anti-discrimination law due to the lack of wheelchair-accessible vehicles. Another ride-hailing service is Chariot, which operates like a private bus line, with numerous routes throughout the city. No bridges. No tolls. Just a scenic vista of San Francisco’s cityscape as you enter and leave the city. There are two ferry systems operating in the bay. 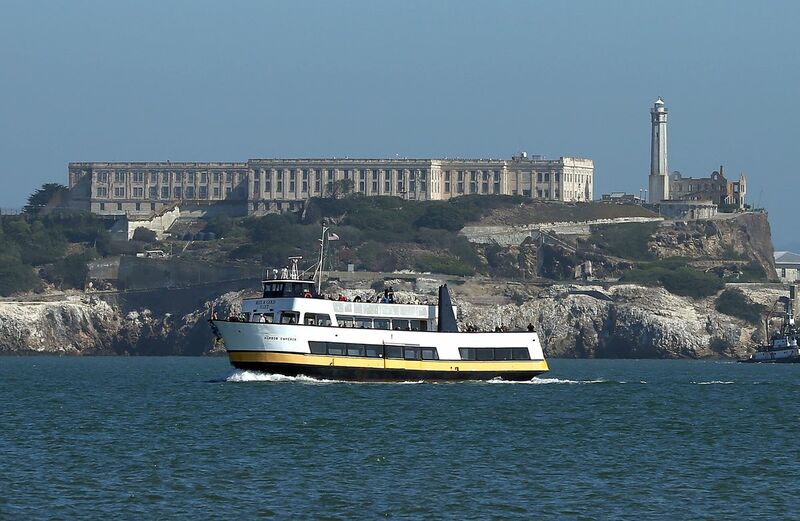 Golden Gate Ferry, which serves San Francisco and North Bay, has terminals in Larkspur, Sausalito, and Tiburon. These ferries can be found at the Ferry Building in San Francisco. Ferries are primarily used by workers heading to and from work, but they’re also an ideal way to spend the weekend at one of our many bay-hugging coastal hamlets. Best of all, you can enjoy a snack or beverage from the full-service bar. And bikes are allowed on board. Fourth and King Caltrain station in SoMa. 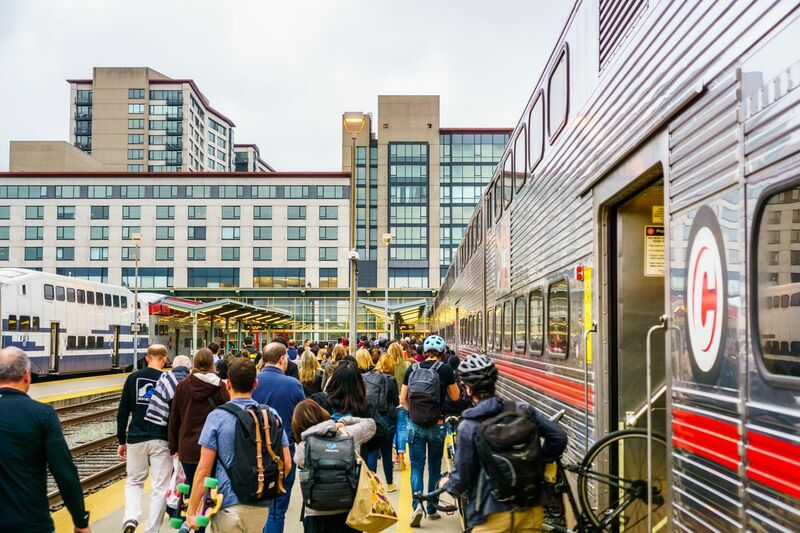 Beginning at Fourth and King in SoMa, the Caltrain system whisks many tech workers and students from San Francisco to South Bay and Silicon Valley. You can even board your bike in the train’s designated car on a first-come, first-served basis. If the bike car is full, the cyclist will have to get off and await the next train. If you are able to get around by foot, it’s an ideal way of traversing the city. San Francisco is blessed to be one of the country’s few cities where most of the populace doesn’t need a personal car. Check out the Curbed SF pedestrian etiquette guide to step up your game. Pedestrian safety is a major issue in San Francisco, with many older adults and people with disabilities needing more time to cross busy streets. As one of the most walkable cities in the United States, the injuries and deaths related to traffic needs are significant, with deaths reaching four times the national average, according to WalkSF. For more about the city’s road safety policy, check out Vision Zero SF.